A diagnosis of fibromyalgia can be very overwhelming. The pain, fatigue, and brain fog can really wipe you out. Then your doctor informs you he will not be giving you any more painkillers to help you cope with the pain. This can come as a pretty hard blow, causing you to wonder how you will ever find relief. This article will discuss just what fibromyalgia is, why some doctors refuse to give pain medication, and what can be done to find relief. Fibromyalgia — What Is It? Fibromyalgia (FM) is a real condition that causes aches and pains all over the body. FM sufferers have tender points throughout their bodies that hurt when they are pressed, even lightly. These tender points are on the neck, shoulders, arms, legs, hips, and back. Fibromyalgia impacts as many as 5 million Americans over the age of 18. FM mostly affects women, who make up 80 to 90 percent of those who are diagnosed. Men and children have also been diagnosed with the disorder, just not as often. Most people are middle-aged when they have their first encounter with this condition. Fibromyalgia often co-occurs with other diseases such as rheumatoid arthritis, lupus, and other kinds of arthritis. If you have a close relative with FM, you are at a higher risk to develop it yourself. A recent trend has been noticed with how doctors interact with their patients in regard to pain medication. 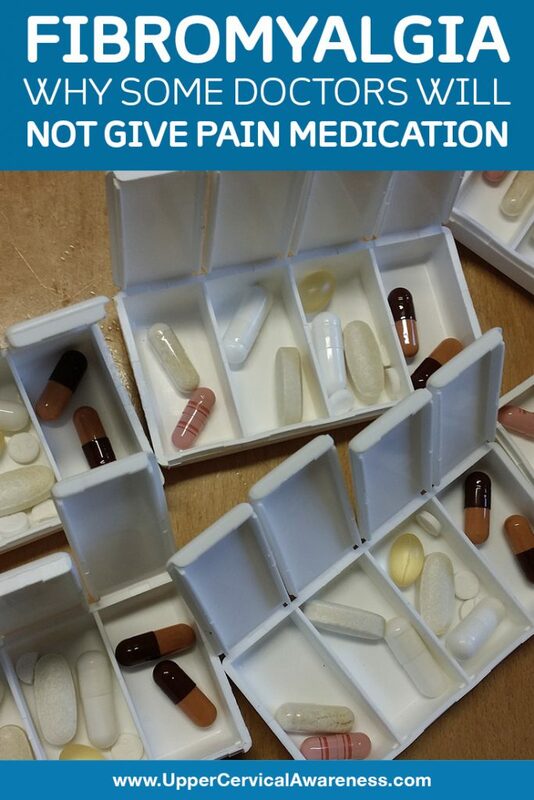 For one thing, this has to do with the fact that many patients do not find relief when they take pain medication. This may be because they are not really experiencing the pain they think they are, but their brain is being told incorrectly there is pain in the body (more on this later). Another big factor playing a role in a doctor’s decision to not give pain meds has to do with a recent court case. A medical doctor was helping his patients cope with fibromyalgia by giving them narcotic pain medication. He was recently indicted for this. He was accused of negligent homicide after one of his patients died. He was charged with 400 felony offenses involving illegal prescription drug distribution. This is serious because many people can become easily addicted to narcotics, especially when dealing with pain on a daily basis. Withdrawal is painful and medically dangerous in some instances. Some people need medical assistance to withdraw but instead may seek illegal ways to get medication. All of this has made medical doctors back away from prescribing pain medication for their fibromyalgia patients. Numerous case studies of fibromyalgia sufferers have been done that point to a type of care that is helping with the pain. The best way to know if something works is to see how it has helped other people. In one situation, a 43-year-old woman was dealing with chronic pain and fatigue for more than 20 years. She was diagnosed with both chronic fatigue and fibromyalgia. She was a seamstress but had to give up her occupation because she was no longer able to lift the heavy bolts of fabric and do the other work that went along with the job. It was just too painful for her. She tried water therapy, physical therapy, massage, and medication with no good results. She still had pain and exhaustion. She began seeking the care of an upper cervical chiropractor. During her initial exam, it was noted that she had an injury to her upper neck. When asked about her history, she recalled going through two very traumatic accidents which had occurred before the onset of her fibromyalgia and chronic fatigue. One was a roll-over accident and the other she was rear-ended at 70 mph. She began getting adjustments on a regular basis and after just two months of care she noted that her sleep had improved significantly, her energy level was much better, and her pain levels were greatly reduced. She was able to resume her seamstress work with no pain. Fibromyalgia has been seen to be linked to a misalignment in the bones of the upper cervical spine, particularly the C1 and C2 vertebrae. These bones are designed to act as a protection for the delicate brainstem. The brainstem is the communication superhighway between the body and the brain. If something is interfering with this process, the brain is not getting the proper signals about what is happening in the body. A misalignment can put the brainstem under stress and cause it to malfunction. It can begin telling the brain there is pain in the body when there is very little or no pain at all. This leads to fibromyalgia. We use a gentle method to help correct this problem. It does not require us to pop or crack the neck or back to get results. We encourage the bones to move back into place without further stressing the body. The results seen are similar to those in the above-mentioned study. Many see the answers they have been looking for with their fibromyalgia.